It was a piece of art that remained in my grandfather’s portfolio; a cashe of his young life in Europe. A time when he traveled with his mother and sister from Canada to England to follow his father in World War One. It seemed to be the most artistic time of his life- maybe I project my own values when I say it seemed his most prolific and happiest. It wasn’t his own art; the signature is indecipherable but certainly not my grandfather’s tell-tale chicken scratch. I always imagined it was a (woodcut?) of the Moulin Rouge. Possibly because it was the only symbolic windmill I have ever known in French culture- I might have been swayed by the movie of the same name that featured the Australian goddess -Nicole Kidman. I was mistaken. I pulled the manila coloured picture from my grandfather’s portfolio with the recent inspiration of a person meeting a real Parisian for the first time this holiday season. I felt some strange pride in knowing that I too had something to share that could be traced back into such an important cultural centre. The windmill in the picture is written Moulin de la Gal..the rest of the words are cut off (this is the moment that I say a silent prayer for the Internet and Online research). Moulin de la Galette has a history that spans almost three centuries. While seen as the more glamourous sibling, the architectural windmill style of the Moulin Rouge, established in 1889, was almost certainly fashioned after the Moulin de la Galette. 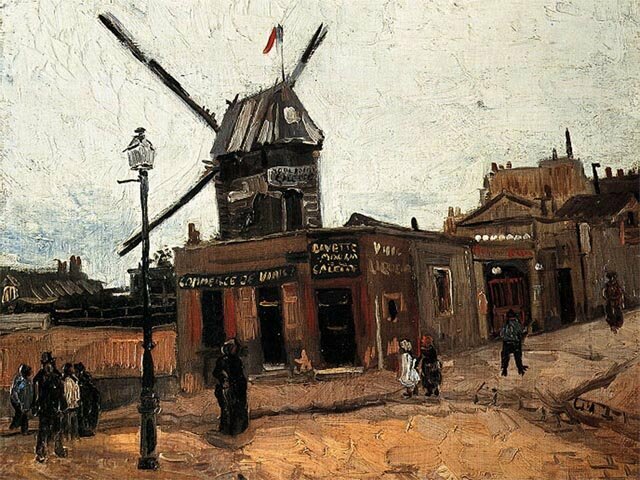 Built in 1622, as a windmill for making bread, the Moulin de la Galette was part of Parisian culture. The Debray family bought it in 1809; by 1814 they sacrificed the head of the house- Pierre-Charles Debray. He was nailed to the windmill as a punishment for his loyalty to his country in the Franco-Prussian war. 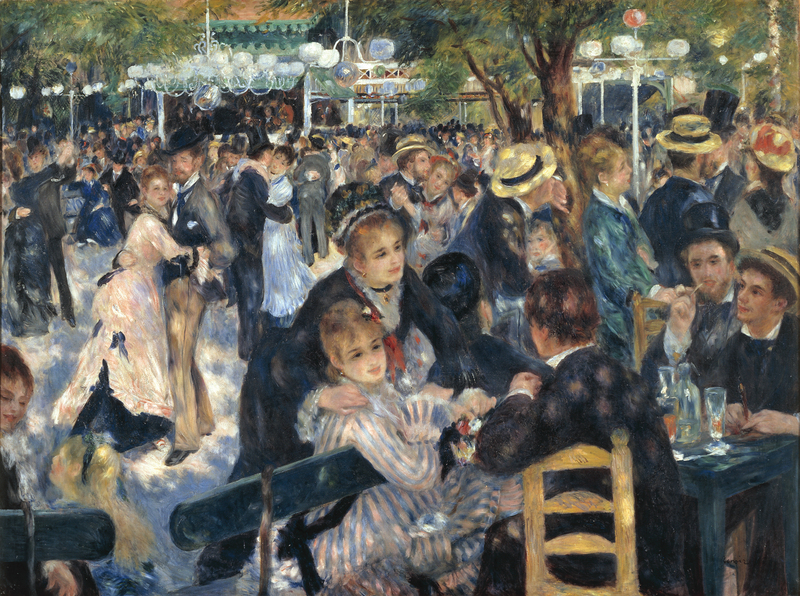 The Moulin de la Galette was the inspiration of many great artists: from Van Gogh to Renoir. Their art is a testament to the timelessness of community and the movement of life inspiring art. Under threat of demolition in 1915, the Moulin de la Gelette was moved in 1924 to the corner of Girardon and Lepic streets. This is the name of the street that is written on the top of my grandfather’s (woodcarving?). If anyone has any information on the artist, the style or the time period of the photo, I would love to hear! This entry was posted in 1920s, Art, historical, World War One and tagged Debray family, Franco-Prussian war, Moulin de la Gelette, Moulin Rouge, Pierre-Charles Debray, Renoir, Rue Girardon, Rue Lepic, Van Gogh, World War One. Bookmark the permalink. Did you ever identify this piece? I just found the same woodblock print in a warehouse! Wow! That is amazing! Outside of the facts I originally found, I didn’t find anything else about the piece.